With nearly 5000 people losing their lives and many more injured in North Carolina speeding-related crashes over the past decade, more concerted and cooperative action is needed to address speeding as a major safety problem in the State. The project team was tasked with conducting a literature review to identify best practices with regard to speed management, to characterize the problem of speeding in the State, and to come up with recommendations that the State might implement to significantly bring down the numbers of killed and seriously injured due to inappropriate speeds. In addition, a Symposium and workshop were organized to identify effective strategies and policies being used around the world that may help to reduce speeding-related safety problems if implemented in North Carolina. Ultimately, 21 different best practice and evidence-based countermeasure recommendations were developed with potential to reduce speeding and severe crashes. 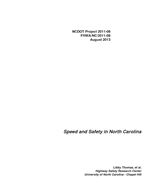 The background information and recommendations developed are described in this report, and the recommendations are summarized in a separate document, "North Carolina Speed Management: Recommendations for Action". Several promising innovative strategies were included among the recommendations. One of the recommendations was to develop approaches to prioritize routes for speed limit and safety review. This report also describes several methods developed, in a second phase of the project, to screen the network to identify and prioritize corridors that may have speeding-related crash problems that could benefit from further problem diagnosis and treatment.